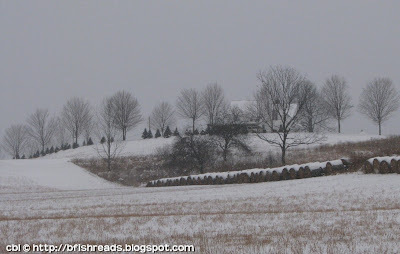 For more Wordless Wednesday, click here. Click photo for full effect. We are both on winter this week. You show the big picture and I've got the details. ...I wish we had a hill. very nice. I love landscapes like that, cold and stark. I had to search for the house! My eyes were drawn to the many lines (the small and tall trees, the row of bales). Very nice to enjoy this view while I'm warm inside. Nice picture, although it's making me feel cold... I like the idea of Wordless Wednesdays. Do you remain completely silent for the duration or is it more blog post specific?! And we also got a fresh inch of snow this night so if I ventured out, I might be able to find something similar. But brrrrr, it looks so cold out there. We had a nice dusting yesterday that freshened the landscape. As long as don't have to drive in it, I don't mind at all. I love it! We had a wonderful surprise snow here in Dallas on Sunday. I think we actually have more snow on the ground than you do. What a beautiful scene! Pretty shot. I just love snow, good thing because we just got a lot of it. I clicked on this pic to enlarge it full screen, and once again you've taken me back to memories of the farm. There I was, cantering on my horse through the open field, feeling my nose tingle and eyes water from the cold. You make me miss having snow. Another beautiful photo. Thank you for sharing. Looks somewhat like our place here in PA except that we have more snow now and more is falling. It's really beautiful but I wonder how the driving will be to Binghamton later today. Brrr... The gray sky looks so cold. Pretty spot for a house though. So pretty! Looks like a scene from around here! Very pretty pastoral shot. One of my law school classmates was born and raised in a pre-Rev. War home that had been in the family for generations, not too far from the site of the Three Mile Island nuclear facility. The home had a spring house, an ice house, a beautiful barn that housed vintage autos and had a second floor with hardwood floors for square dance and folk dance parties. This image reminds me of visiting his family home years ago. you could title this "winters hush"
How quaint and homey....makes you want to stay snuggled up next to a roaring fire all winter. Happy WW! Very pretty! Happy to see less snow than we have here in Massachusetts today, I must admit. The snow is pretty but I'm ready for spring! Sure glad I had a cup of tea and a blanket to keep me warm when I 'opened the window' to this gorgeous view! Oh this is wonderful. Beautiful and moody all at the same time. It also makes me want to turn the heat up. Such a beautiful picture! Just makes me want to curl up with a good book by a fire. We don't get snow her too often, so I always enjoy living vicariously through others. Beautiful! It makes me miss the snow days we had in Oregon. Beautiful shot! Winter always makes everything look so forlorn to me. I love how the trees are looking in winter. They make very pretty pictures like that.